Hey friends, I wanted to share some big news with you all. Many of you have been reading my blog for a long time and have become dear friends. I've met a few of you in real life and I just have to say, the internet is the BEST! Anyway, when you have big news, you share it with your friends... so, I hope you'll all be as excited as I am about this news. After three years of doing e-design through this blog, I finally decided to go for it and really dedicate myself to my decorating designs business! 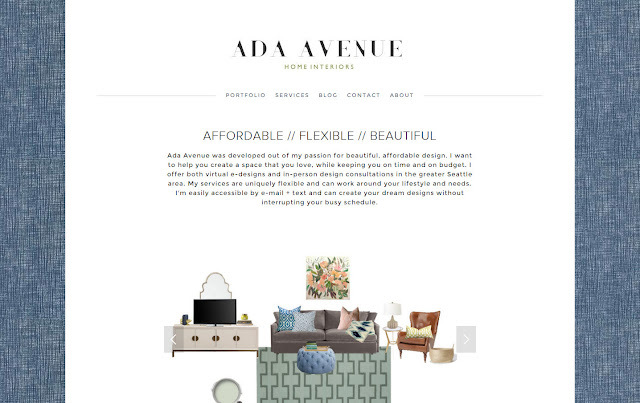 I would love it so much if you would take a look at my new website, Ada Avenue Home Interiors. I've put my heart and soul into each design that I've done in the last few years and feel excited and nervous about the future at Ada Avenue (mostly butterflies-in-my-stomach-excited). I hope you'll check it out and pass it on, if you feel so inclined. I'm also on Instagram at adaavenuedesigns where I'll post some of my favorite designs, inspiration, design tips and sources of some of my favorite products. I'll still be blogging here at Lizzy Write but I felt it was time to separate my lifestyle blog from my design work.